Today has been a good day. And I’ve come to realize that I have the power to make all my days good days. Breakfast is the most important meal of the day and the better the breakfast the better the day, right? 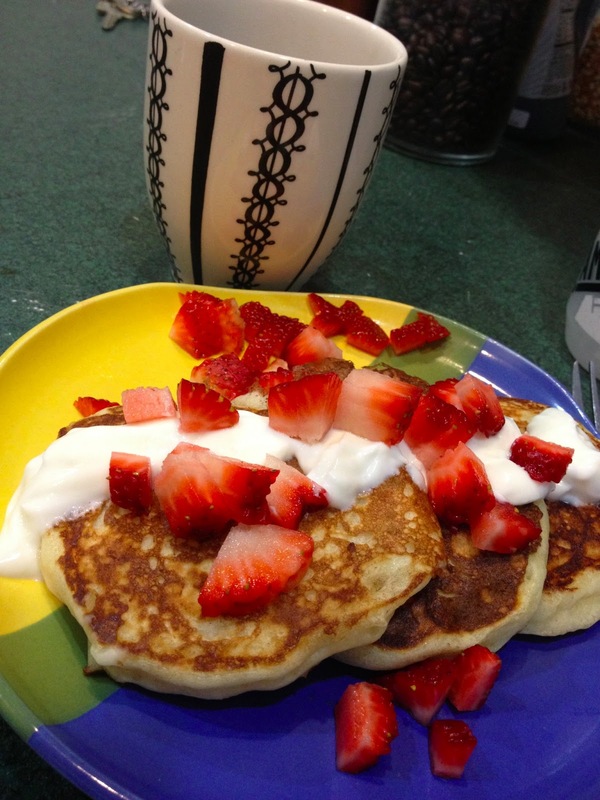 TJ’s vanilla bean Greek yogurt pancakes kicked up a notch (ha) with shredded coconut and fresh strawberries. Delicious. This breakfast was so satisfying, I forgot about my beloved Greek yogurt pancakes for awhile and I’m so glad I made them this morning. Work was work. It went by quickly and I was daydreaming of adult beverages on a patio but I knew I had Jillian planned for the evening. When my friend texted to say she couldn’t make it I was so tempted to ask everyone I knew to meet me for a margarita but I stayed strong. I got home, changed and was out the door for a run within 5 minutes. I’m experimenting with using my heart rate monitor to train in different zones (more on that in another post) so I did a super easy 5 miles. I’ve been slacking on strength and I knew some quality time with Jillian would only make my good day better so I stuck with my plan and followed the run up with NMTZ. Doing it with my friend each week is so nice but something about doing it alone made me feel so accomplished. And hungry! As I mentioned last post I’ve been spending a lot of time in the kitchen and to be honest I feel like for every successful experiment I have at least 3 failures. 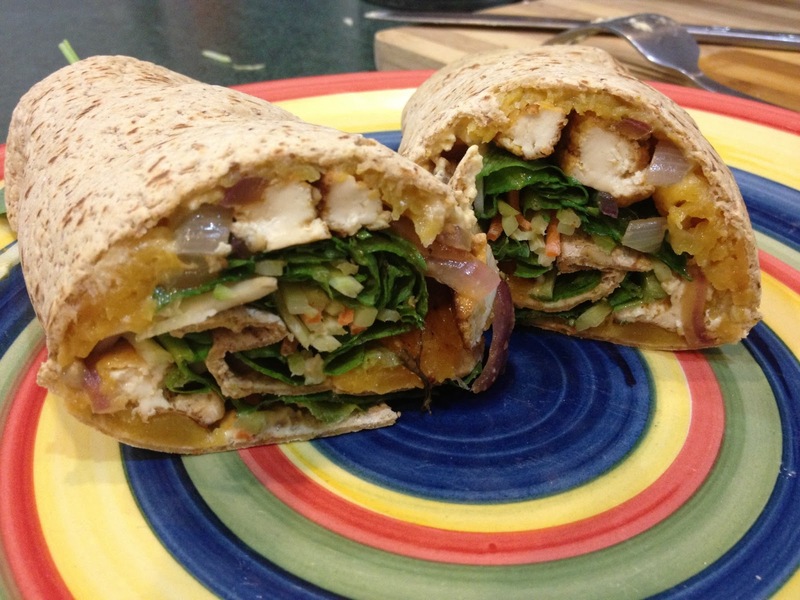 The failures aren’t so fun- especially when I need to eat them anyways because I’m trying not to be wasteful. Luckily tonight was nothing but success! I knew I wanted something quick and easy. 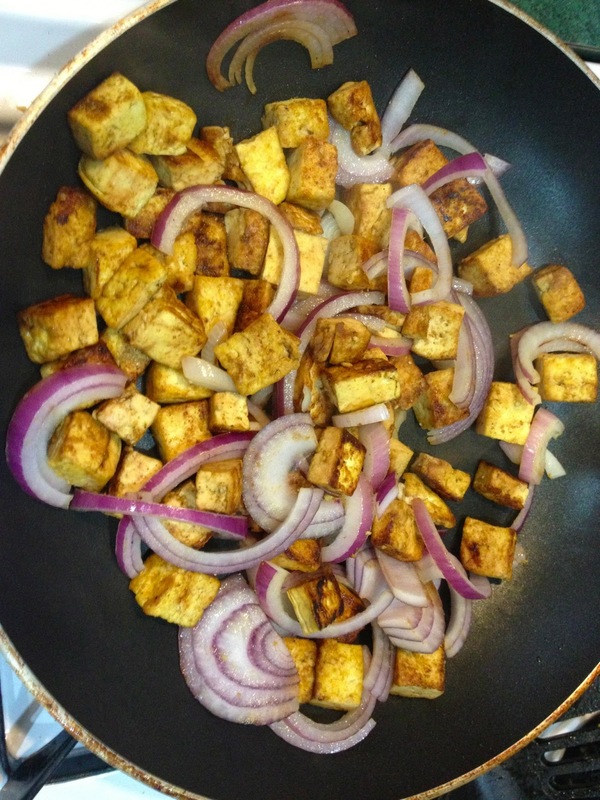 I chopped up some tofu and threw it into a pan with some curry powder, soy sauce and red onion. 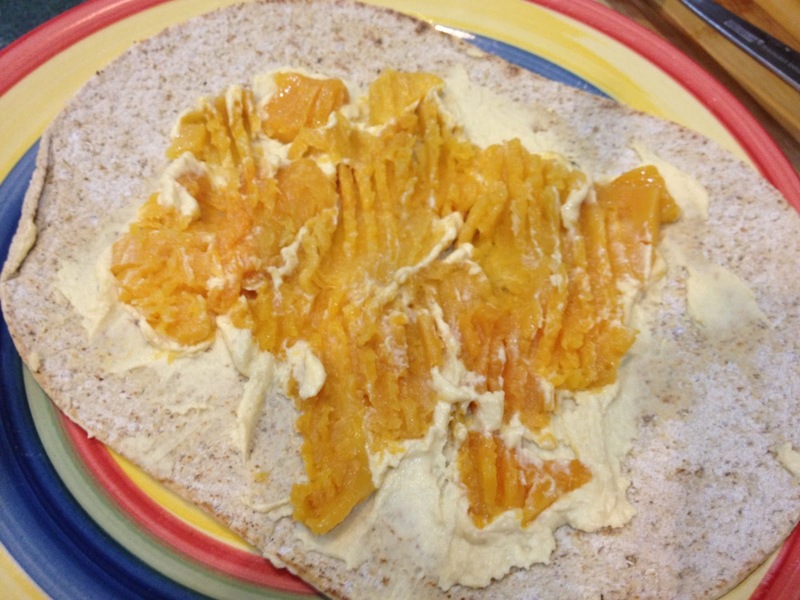 I spread some plain hummus and mashed butternut squash (both from TJs, the precut butternut squash is awesome) on a Flatout flax seed wrap. 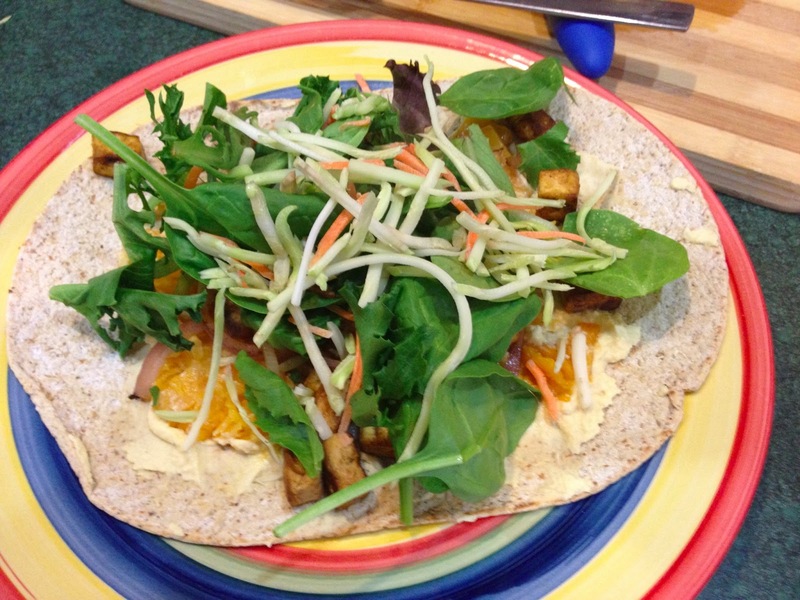 Topped it off with the tofu & onions, mixed greens and broccoli slaw. I always forget how convenient wraps are, a nice little package of everything I needed. I’m still feeling pretty snacky so I foresee popcorn and something dessert-like. I earned it, right?